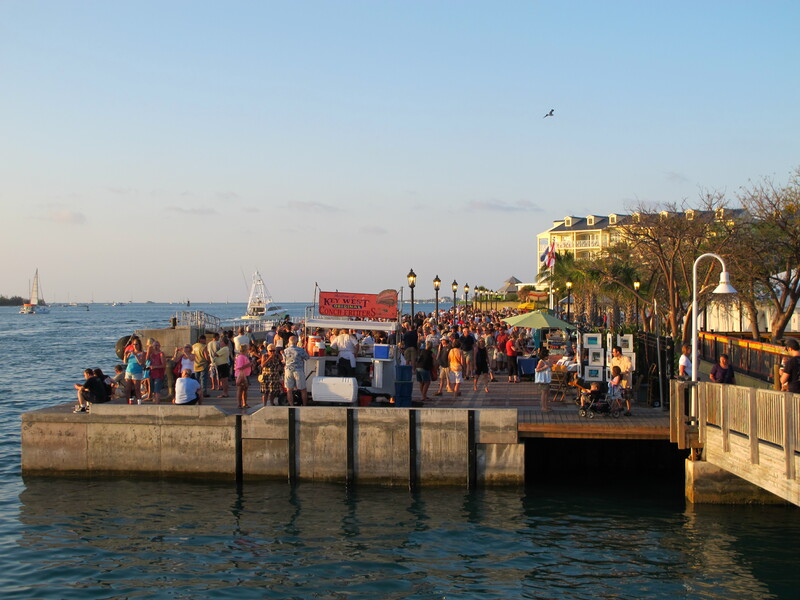 Key West was the perfect pick for a Spring break before the end of winter in chilly New York City. It offered up plenty of sunshine, a relaxing pace, endless fab spots to eat and drink, and lots of exploring. 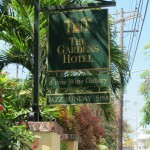 Basing ourselves at The Gardens Hotelwas an excellent recommendation by a friend who has lived in Key West for several years. Once the largest private estate in Key West, the expansive grounds of the hotel comprise just over an acre of tropical landscaping. 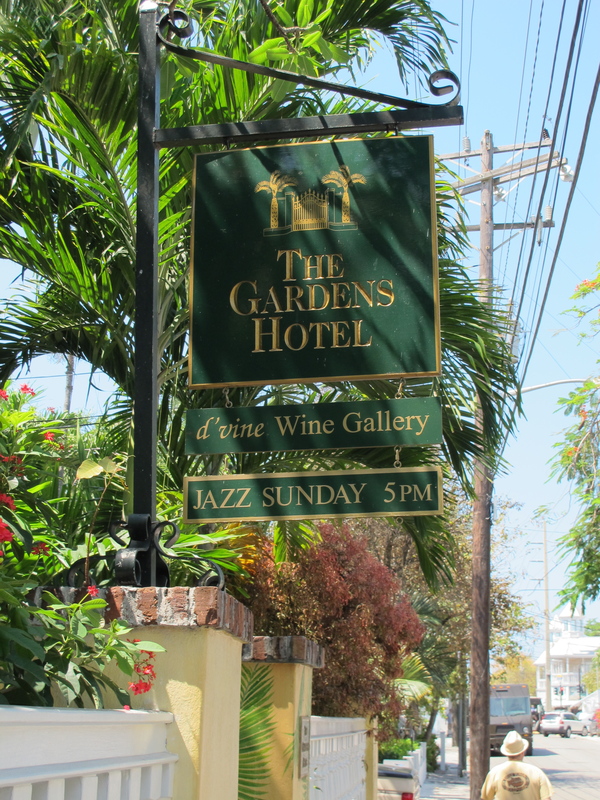 And it’s conveniently-situated less than a block from the main street, Duval, and halfway between Mallory Square where everyone goes to watch the sunset nightly, and the Southernmost Point of the island. Being a bit of a winelover, I particularly liked the hotel’s “d’vine wine gallary” where a pre-loaded card is given to you upon check-in which you may use to deliver a taste, a flight or a full glass of wine from a series of dispensing machines displaying some 30 or so bottles. Plenty of choice to experiment with! One of the first places we hit on Duval was Sloppy Joe’s which is apparently a Key West tradition, but also a bit of a tourist haunt. That didn’t bother us because we fell in love with the group currently playing – a family of kids called The Doerfels. They were amazingly good. After Sloppy Joe’s, we hit our first sunset at Mallory Square. 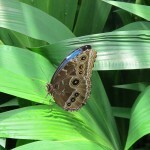 It’s a bit of a zoo, but a must at least once during a stay. Best viewing (and slightly less of a scene) can be found on the Sunset Deck balcony bar of the Westin Hotel. Other great spots we found for eating or drinking included the A&B Lobster House in the Historic Seaport District – where we also caught a schooner trip on the Adirondack III on our last night – a fabulous experience. Great dining also can be found at nine one five on Duval, and Salute does an excellent lunch outside at Higgs Beach. 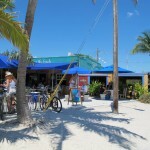 After Salute, hit the Afterdeck Bar at Louie’s Backyard for a chilled couple of beers on the beach (at Dog Beach). Good food there, too. The Green Parrot bar is supposed to be a great music spot, but there wasn’t much going on there during our stay. 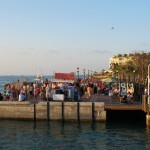 There are two must sightseeing trips in Key West. 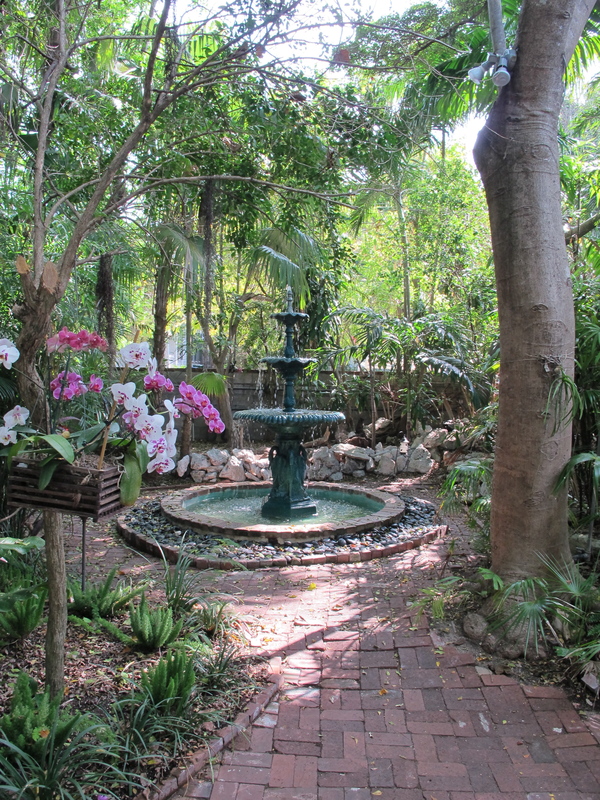 One is the Ernest Hemingway Home and Museum where locals give guided tours through the home and the surrounding gardens, with sporadic introductions to the supposed descendants of Hemingway’s six-toed cats. 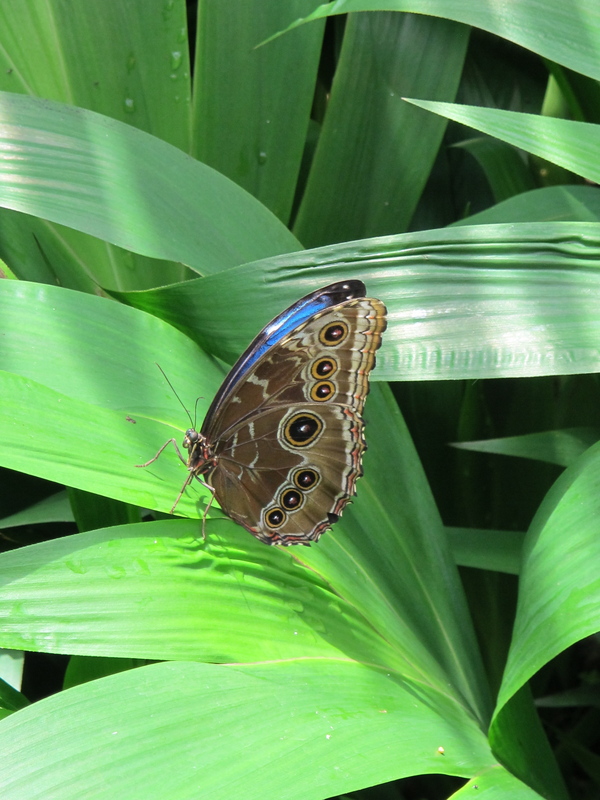 The other must-see is the Key West Butterfly & Nature Conservatory where more than 50 species of colorful butterflies co-exist with birds and tropical vegetation in a gigantic glass-encased bubble, complete with air-conditioning. It really is quite spectacular. 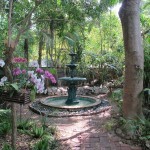 And if you’re into art, Key West boasts numerous interesting galleries. We were fortunate enough to be invited by our friends to an event at the Lucky Street Gallery on Duval, and we also popped into several others including 7 Artists which was part gallery / part shop. One warning: When we decided on a short break to the Keys, we felt we needed to see it all. We didn’t. We flew into Miami and drove our rental car the entire length of the Keys down to Key West where we were staying, and back up to Miami for our return to New York. It was interesting, but it was a slow and laborious drive, and on a single lane road behind an accident on our way back, we nearly didn’t make it to the airport in time. 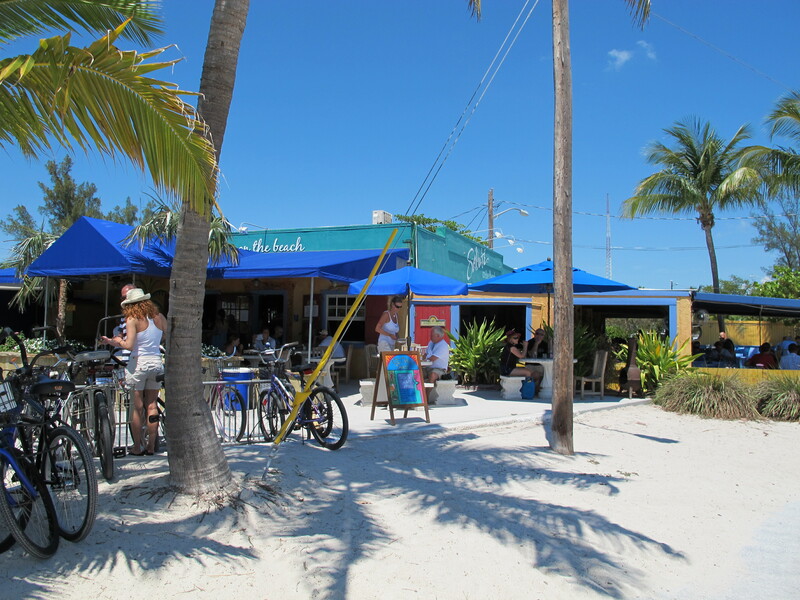 Besides, once you reach Key West, you can ditch the car – almost everything is walkable! The winter South American tan is fading but the glow of our trip to Buenos Aires and Colonia del Sacramento across the Rio de la Plata in Uruguay is still with me. We couldn’t have left New York City at a better time, just before the blizzard of Boxing Day (our flight the next evening was cancelled). Arriving on the Sunday after Christmas, we were happy to just mill around our ‘hood of Soho Palermo soaking in the 90-degree warmth. Catching lunch at a non-descript café in the shopping quarter of calles Costa Rica, El Salvador and Honduras, and wandering around Plaza Cortazar, having beers at Madagascar overlooking the square, suited us to the ground. And we didn’t expect such a great Italian dinner that first night at La Baita (Thames 1603 at the corner of Honduras). We checked out of BoBo Hotel the next morning and made our way to our next stomping grounds, Home Hotel, another great boutique pad where we were greeted very warmly and provided the grooviest of little booklets area called the “Home Guide” which provided all sorts of tips for dining, bars, clubs, shopping and galleries, and an added bonus of a “Home GPS to Argentine Beef” explaining the different cuts and terms. Both Bobo and Home provided us with great little maps of the neighborhoods as well. First order of the day was to take the get the lay of the land. To do that, we took the Bus Turistíco Cuidad de Buenos Aires which is a hop-on/hop-off city guide bus that makes 12 stops and runs every 30 minutes. It was the perfect way to see the city and to hear about its history and famous landmarks since audio was available in several languages via headphones at each seat. From Recoleta, we wound our way around San Nicolas, San Telmo, La Boca, Puerto Madero, Retiro and back. Thank you Carla Lucentini for recommending the tour! That evening we dined just 2 blocks from Home at Azema Restaurante (Carranza 1875) which was an exotic blend of Vietnamese and Moroccan cuisine. The next day was our leather shopping spree and we set off to Silvia y Mario (Marcello T de Alvear 550 across from the Marriott Hotel), which was highly recommended by my good friend Maruta Bergmanis. I would recommend Silvia y Mario on to anyone interested in leather. I bought a wonderful long black shearling for which I paid probably less than a quarter of what I would have paid in the US – and which they took in for me for nothing extra, and a made-to-order little black leather blazer based on a magazine picture I had brought in with me. Malcolm bought a shearling jacket, again for a fraction of American prices, and made to order by size. Everything was to be ready in four days! From there, we explored Puerto Madero and had lunch at Bice (an Italian eatery) and then wandered over to the Florida Mall and Galerias Pacifico at Florida and Cordoba. It was an attractive little mall all dolled up for the holidays, but quite American feeling except for the plethora of cool Argentinian brands, and it provided a welcome respite from the heat outside. We returned to Home Hotel and had a drink at the poolside bar before heading to Grappa (El Salvador 5802 at Carranza) where we had bar snacks for dinner. It was a bustling popular place and we immediately wished we had eaten there the previous night when we went to Azema which is virtually across the street. Grappa was much more in keeping with Argentinian dining and a great atmosphere. The next day we were off on our Uruguayan adventure, and while there was a massive queue to board the Buquebus ferry, it was worth the hour-long journey. 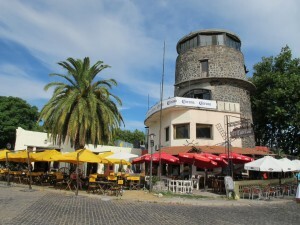 Colonia del Sacramento was listed as number 31 in The New York Times’ “41 Places To Go in 2011” featured in the paper’s Sunday, January 9, travel section. 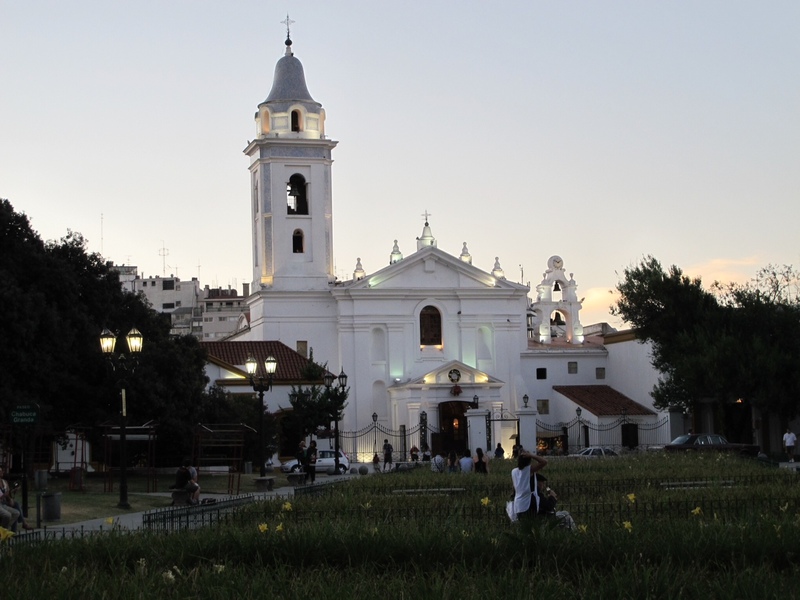 A Unesco World Heritage site, Colonia del Sacarmento was a great diversion from the city life of Buenos Aires. Small, charming and hugely photogenic, there was no shortage of little shops, bars and restaurants to explore amidst sycamore-lined streets and, for some bizarre reason, historic cars dotted about everywhere. Places worth a visit include El Torreon, a bar/café facing the river on Plazoleta San Martin – we watched a picturesque sunset over a bottle of wine both nights we were there. 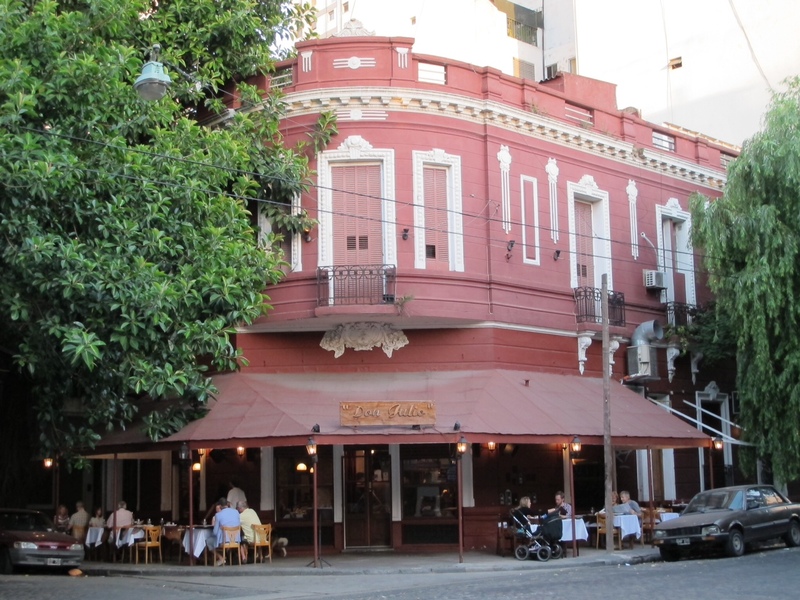 We dined at two great restaurants: Pulpería de los Faroles (Misiones de los Tapes 101) with seating outside on Plaza Mayor 25 de Mayo, and El Rincón de los Tapes 41) with dining near the grill in the restaurant’s back garden overlooking the river. Both offered excellent steaks and a range of other things. El Drugstore, across the square from the Basilica of the Holy Sacrament, was eclectic and therefore good for pics, but the food was disappointing. Unusually, I didn’t do my usual heavy shopping, but one place worth a visit was definitely Almacen La Carlota at the corner of Calle Real and Calle de la Playa. Note they do not take plastic – only Ururguayan dollars, Argentinian dollars or US dollars. The Feria Artensanal open handicrafts market on the northern waterfront was not worth the walk. We returned to Buenos Aires on New Year’s Eve. Thinking we’d just happen upon a quiet restaurant in which to spend the evening, we discovered that most restaurants were closed. Porteňos (people from BA) apparently dine with their families on New Year’s Eve and then maybe go out later. Those restaurants that were open were having private parties. We finally got into Cabaňa Las Lilas in Puerto Madero and had a brilliant seven-course dinner, tango show and disco – and two fireworks shows over the port. A fabulous evening. And interesting to note that Las Lilas had been recommended by, Sheryl, a friend of our friend John Begley. New Year’s Day was spent by the pool (Four Seasons) and exploring the wealthy neighborhood of Recoleta. A must there is Café La Biela (Avenida Quintana 596) which overlooks the Iglesia de Nuestra Seňora del Pilar, a beautiful white church beside the Cementerio de la Recoleta. We had to pounce to get a table outdoors, but it was worth it to dine under the enormous gum tree which takes over the entire square. The Cementerio de la Recoleta – one of the world’s great necropolises – is worth a stroll as well. Covering 14 acres, I particularly enjoyed seeing Eva Perón’s tomb and the hundreds of other elaborate tombs and mausoleums. Completing the area, we walked through the Plaza Intendente Alvear open market. We thought that the Sunday after New Year’s would be quiet as well, but after a wander around Plaza de Mayo and the historical Casa Rosada, we entered Calle Defensa and found a never-ending and bustling street market which led all the way past the San Telmo Market to Plaza Dorrego where tango dancers performed on the street and antiques dealers sold their wares. We stopped for lunch at an eclectic café called Nefertiti (Humberto Primo 420), and then carried on to Puerto Madero where we explored the opposite bank and checked out Philip Stark’s Faena Hotel, having a beer in its elaborate bar. We completed our walk by ending up in nearby park Reserva Ecologica Costanera Sur, a BIG mistake because in the heat of the summer, it was like walking around a giant dustbowl. That evening, we dined at Recoleta restaurant Lola (Roberto M Ortiz 1805), again outside, and then we popped into the Alvear Palace Hotel for a drink at the bar, before returning to our own Four Seasons bar. Just when we thought we’d done everything, on our last night in BA we went back to where we started our trip in the Palermo Soho area and had an aperitif at Mamaracha’s balcony (Costa Rica 4602) and we had our best dinner yet at Don Julio (Cabrera 5099 at Thames). The food was beyond superb, and the atmosphere was brilliant. Try the Provoleta – a grilled aged provolone cheese eaten as a starter. Don Julio had been recommended both by Maruta and Sheryl. 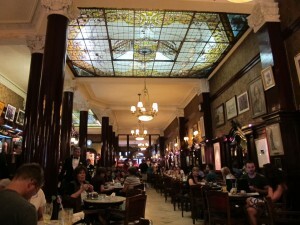 On our last morning, we finally made it into the historic Café Tortoni (Ave de Mayo 829) without having to queue. 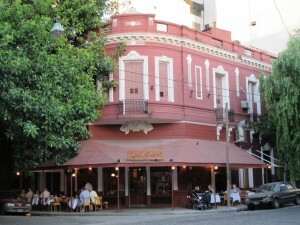 Opened in 1858, it’s one of the oldest in BA and as such, a landmark. We also did a bit of shopping, checking out the Patio Bullrush shopping mall in Recoleta (on Calle Posadas) which, again, provided a respite from the heat outside and which featured many well-known Argentinian brands such as Prűne and Salsipuedes, as well as some global brands. My favorite, down the street, was Peter Kent which specializes in handbags of course! TIPS – Get Argentinian currency in advance, especially small bills. We spent more time queuing at ATMs in the first few days of our trip than we’ve spent in a year, or three. And the ATMs spit out predominantly $100 bills only – which are difficult to change – or worse, nothing at all because they’ve run out of money altogether. Seriously, there is a shortage of currency in Argentina. BOOKS – Eyewitness Travel Argentina – I love the Eyewitness guides, but I think I used this one more than I have on any other trip. It was really helpful and insightful. It Takes Two by Patrizia Chen was a nice steamy novel based around the tango, a good read for my down time poolside. Lonely Planet’s Uruguay Custom Guide was difficult to find, but helpful. And my Streetwise Buenos Aires laminated map was indispensible even though every hotel provided maps. MISSED – I wish we had walked around La Boca, if only to take photos, but we were warned off because of pickpockets, which apparently are rampant everywhere but worse in La Boca. Take extra care with your belongings. We were lucky but we were vigilant. Other places recommended I wish we had tried include El Dora on Paseo Colon (magnificent seafood), Desnivel (Defensa 855 in San Telmo), and Los Immortales (“traditional pizza”). I also found a great article in TravelIntelligence.com upon returning that I wish I had seen before we went, particularly about the shopping.